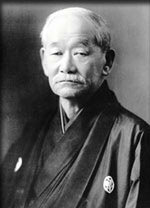 Jigoro Kano - the Founder of Kodokan Judo. The following is a transcript of a lecture he gave at the Parnassus Society, Athens, Greece, on June 5, 1934. Ever since I came to work in public, I have been engaged in Education, for some time filling the post of the Director of the Bureau of Primary and Secondary Education in Japan, and for 24 years being the Principal of the Higher Normal College in Tokyo. As is natural for a man of such a career, I had to answer many questions like the following:1. The use of religion as a means of moral culture no one doubts. But as morals are taught in religion not by reason, but by ‘faith’ or belief, there may be different persons having different beliefs. How can one decide which belief is correct and which is not? In this stage of enlightenment we must solve this question in a way to which everybody will agree. How do you solve this question? 2. Since thousands of years, thinkers of different countries have advanced hundreds of different views regarding morals. Some have arrived at certain conclusions through their own process of reasoning while others came to advocate something different also from their way of thinking. This is the reason why there are so many different ethical systems. They have been contending under different banners from the time of Plato and Aristotle in the West and of Lao-tse and Confucius in the East. There seems to be no end to the disputes. How do you reconcile these different views? 3. We all respect tradition and nobody would think lightly of the importance of tradition in the teaching of morals. But how can we prove that morals taught by tradition are always correct, and never need alteration? Do not facts prove that some of the teachings of morality deemed most important at a certain stage in the progress of mankind came to diminish in importance at a later stage? Do not different countries differ in their traditions? Is there any reliable test by which to judge the validity of such tradition so that we can keep to those which we deem valid? Often confronted with questions like these, it occurred to me that the principles of Judo which I have been studying since my young days can best solve such difficult questions. So I tried to apply these principles to the solution of all the different problems I had to encounter, and in no case did I find any difficulty in applying them. 1st. ‘Whatever be the object, the best way of attaining it shall be the maximum or the highest efficient use of mental and physical energy directed to that aim. If I had time, and the nature of this Parnassus Society were such to allow me to explain the process by which I had arrived at my conclusions, it would be very interesting and easier for you to understand the real import of what I am going to say. However, leaving that part to a Lecture to be given on some other occasion, I shall now proceed to show you how to apply those principles to different phases of Human Activity. In feudal times in Japan there were many martial exercises such as fencing, archery, the use of spears, etc. Amongst them was one called Jujitsu, which consisted principally of the different ways of fighting without weapons, although occasionally some weapons were used. In my young days I studied two different schools of this art under three eminent masters of the time. I further received instructions from many other masters representing other schools. But Jujitsu originally was not an application to contests of the principles of science but simply a group of different methods of attack and defense devised by different masters, one school representing a group of methods devised by one master and other schools representing the devices of others. Such being the case, there was no fundamental principle by which to test the validity of those methods. This new attempt proved very successful. In Japan to-day almost no one studies the old methods, Judo being taught in almost all schools above middle grade as well as in the army, navy and the police, and the name Jujitsu has almost been superseded by the new name Judo. This success in the application of the principle of maximum efficiency to the method of contest led me to think it advisable to make a similar attempt in connection with physical education. In dealing with this matter I must first of all make clear what is the aim of physical education. I believe the aim of physical education should include at least the four following items: Health, Strength, Utility and Spiritual Training, including Intellectual, Moral, and Aesthetic phases. Nobody would disagree with this statement, but I wish to call your special attention to the fact that nobody, even the specialists in physical education, seems to study the respective importance of those four items. Are not many of the promoters of physical education laying too much strength and skill? Are not teachers of gymnastics paying their attention almost exclusively to the interior organs and the harmonious development of the body? Into such mistakes people naturally fall because the aim of physical education is not clearly set forth and the inter-relation of these four items is not seriously studied. This happens because the principle of Maximum-Efficiency is not yet universally recognized and but few people seem to study such a subject from the point of view of this principle. I shall now proceed to speak about the application of this principle to moral and intellectual training. In a similar way as I have said in connection with the four items of physical education, the inter-relation of intellectual and moral culture as well as these two with physical culture should be a subject of serious study. However, not only people at large but even educators are quite indifferent to this. In intellectual culture, strictly speaking, the acquisition of knowledge and the cultivation of intellectual power are so correlated that they cannot be treated separately. Still, the cultivation of the power of reasoning and judgment and the mere acquisition of knowledge may be looked at in different lights and the respective share they should have in intellectual culture should be specially studied. Moral culture also includes several items, and the inter-relation and relative importance of those items should be carefully considered. First of all moral culture must be pursued from the intellectual side, enabling a man to know what is right and what is wrong and also enabling him to reason out and decide this even under complicated circumstances. At the same time cultivation of the emotional and volitional power, as well as the importance of forming good habits, must not be forgotten. But very few people seem to study these things seriously. This, I believe, is also due to the lack of recognition of the Principle of Maximum-Efficiency. Culture, whether it be physical, intellectual or moral, can only be properly acquired when due consideration is given to the relative importance and correlation of different items included in that culture. I shall now give one very simple example of how most people are in their daily life regardless of this all important principle. Whenever one has to read a book, magazine or newspaper, on should select out of many such as are deemed most profitable to read at the time. But most people are too regardless about those matters. The same thing can be said in regard to diet, clothing and housing, and the choosing of things we buy, in the transaction of business, in short, in all daily dealings in Life. Only through the right understanding and correct application of this principle can one make one’s body strong, healthy and useful. One can become a person of high moral and intellectual standing. One can accumulate wealth, sufficient not only to make oneself happy but also to be able to help others and spend for the good of society. Only people who are loyal to our principle can become such men. Thus, if this principle is applicable to all phases of human activity, the same thing must hold true in regard to the activity of a group of men, whether that be small, as in the case of a party of a few persons or large as in the case of a nation having a large population. But for a group of men to act as an individual it must be well organized, so that every member of the group shall act in harmony one with the other. This harmony can only be attained and retained by mutual aid and concession, leading to mutual welfare and benefit. This mutual aid and concession is therefore another fundamental principle of Judo which is very important for the keying-up and perfecting of social life. Cannot, then, this same principle be applied in a similar way to international relations? I conclude my Lecture by quoting a part of my speech which I made in Madrid last year on the occasion of the Meeting of the Inter-parliamentary Union. ‘Fortunately the ideal of international life does not differ greatly among civilized peoples, but when one is asked what lies in the background to make different people have a similar ideal, one may perhaps be puzzled. The moral ideal of religion having belief as its background cannot explain it, since there is no reason why all beliefs should coincide. Then can different systems of philosophy be regarded as the determining force of such coincidence? It cannot be sought in philosophy, because those philosophical systems stand aloof from each other and can never be reconciled. ‘Then what is the real determining force of such a coincidence? ‘The determining force lies in this. Civilized people, living in society, do not even dream of quitting the social life and living entirely secluded from other people. As long as a person wishes to be a member of the community, he must deem it his duty to keep society in being and do his part to prevent its disintegration. Again, so long as a man lives in society he himself is benefited by its progress, while on the other hand, if society deteriorates he loses what he might otherwise get. When any member of society is made conscious of these facts he will be led automatically to endeavor to maintain and improve our social life. To maintain social life every individual member of it must know how to refrain from egoistic conduct and must concede to and help others whenever that is necessary to that end. At the same time one must endeavor to the best of one’s ability to serve society, remembering also to care for oneself so long as that does not conflict with the interests of others and of society at large. This benefiting of society as well as of himself can best be achieved by the highest or the maximum-efficient use of mental and physical energy in that direction. In short, the highest or the maximum-efficient use of mental and physical energy for attaining one’s aim on the one hand, and the mutual aid and concession aiming at mutual welfare and benefit on the other, are the two great determining factors of social harmony and progress. Whether consciously or not, civilized people are being led by these factors. The fact that people now speak so much of efficiency and scientific management, the fact that the League of Nations was formed, and that security and disarmament have nowadays become outstanding subjects, all these show that those factors should be thoroughly studied and their true spirit proclaimed to the whole world.